What could be more beautiful than 138 pounds of chocolate? Each sack is 3 kg (6.6 pounds) of chocolate, for a total of 63 kg, or 138 lbs. Because cool weather is in this weekend’s forecast, I’m going to seize the day and run some test flavors. Caramels this weekend, I think – and marshmallows, if time allows. Looking forward to it! And the other beautiful thing? Amazing Grace – fully threaded! 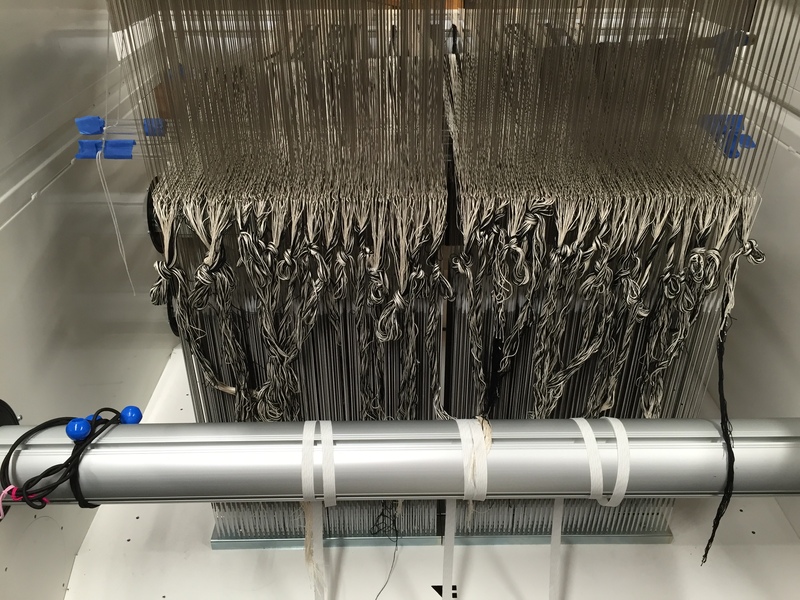 Yep – finished threading last night. I got the front beam back on this morning, but my auto reed hook has disappeared, so I can’t start sleying until it’s found. I may pick up another one tonight, if I can get one at my local yarn/weaving shop, Purlescence Yarns. Congratulations! Both the chocolate and threaded Amazing Grace are beautiful things to behold! Absolutely beautiful….congratulations Tien, Looking forward to the next steps – in both adventures! I notice that you have different varieties of dark chocolate. Do you experiment with different ones to figure out which works best with a given flavor, or is that already part of your “flavor vocabulary”? Yes to both! 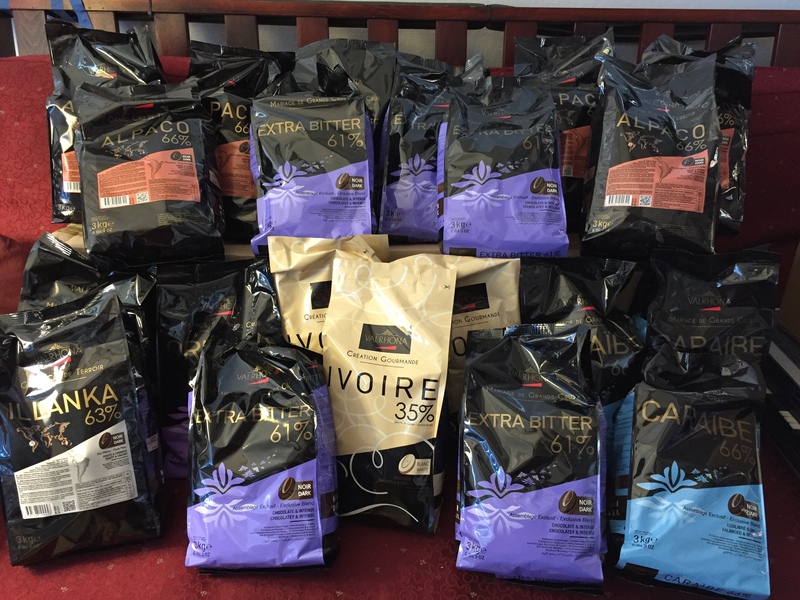 I’ve done a ton of sampling over the years and eventually settled on four Valrhona varieties: Alpaco, Caraibe, Extra Bitter, and Manjari. Alpaco has floral and citrusy overtones, so I use it with flavors like my jasmine tea/orange blossom honey/vanilla caramels, or with candied citrus peels. Caraibe has a wonderful fruitiness with hints of almond and coffee – I use it for dipping fruit and nut flavors, but it’s versatile enough to be used with almost anything. Extra Bitter is an extra dark roast, but not unpleasantly bitter at all – it’s my go-to chocolate for almost everything. Manjari is a *very* fruity, almost raisin-y chocolate – usually I get one bag to use in mixing up fruit centers, but since I was trying to buy case quantities for each chocolate, I skipped it this year. Instead I bought a 3 kg sack of Illanka, which is a new “flavor” (variety?) designed for making centers. Haven’t tried using it yet. 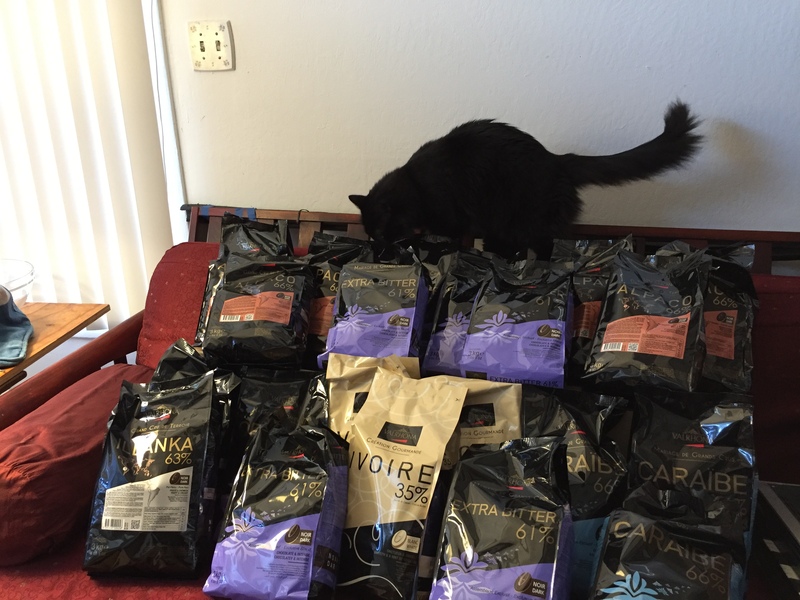 This year I bought 2 cases (~40 lb) of Alpaco and Extra Bitter, one case (~20 lb) of Caraibe, and one case of Ivoire (Valrhona’s white chocolate, and the only white chocolate I think is worth eating). I also got one sack of dark chocolate (Illanka) and one of milk chocolate (Orizaba). I’m always trying new varietals as they come out. But I stick with the Valrhona brand – over the years, I’ve tried all the major high-quality brands and Valrhona has consistently come out on top, both in terms of complex, interesting flavor and in being easy to use. It is generally regarded by pastry chefs as one of the best, if not *the* best, chocolates in the world, and pastry chefs that use Valrhona chocolate usually brag about it on their menus. Thanks–this is fascinating stuff. I’ve read about how chocolate can have different flavors, but this is the first explanation I’ve heard about how those flavors can work with other flavors.